1789 During a severe winter storm 70 sailing ships and 600 men were lost off the Norfolk Coast. An inquiry into the tragedy drew attention to the complete lack of warning lights between the fire beacon at Cromer and the candle-powered light at Winterton. 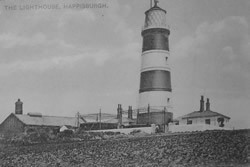 Trinity House, the general lighthouse authority for England and Wales, subsequently erected two lighthouses at Happisburgh: the Low Light on the Cliff Top and the High Light (the present lighthouse) 400 yards inland. 1791 Both Lighthouses came into operation on the evening of New Year’s Day. By keeping both lights in line, vessels were guided around the southern end of the sands and onto the sheltered stretch of water known as ‘The Would’. 1801 The candle lanterns were replaced by oil lamps with polished reflectors. 1863 A new lantern, of revolutionary design, was installed. This is the lantern which tops the lighthouse today. It consists of diagonal frames which cross each other at a constant angle enabling shipping to see the light from all angles to seaward. 1865 Cannel Gas was introduced as the light source. As there was no local supply, the gas was manufactured from coal on the premises and stored in two large gas holders in the yard behind the lighthouse. 1868 A new optic was fitted. Because Happisburgh was a fixed light (not flashing) at that time the new equipment did not need to rotate, making the installation much easier. The optic, consisting of many glass prisms and a central lens gave the High Light a range of 17 miles; the Low Light had a range of 15 miles. 1883 The Low Light, threatened by coast erosion was withdrawn from service and demolished. The fixed beacon of the High Light was changed to an occulting character, the light shining for 25 seconds followed by a 5 second eclipse. 1884 Now that there was only one tower at Happisburgh, it was necessary to distinguish it from the tower at Winterton during daylight. This was achieved by painting the Happisburgh tower with the three broad red bands which we see today. 1910 Paraffin-vapour burners replaced the gas light. 1929 Acetylene made it possible to dispense with the resident keepers, although an attendant was still required to check the light periodically. The Keepers’ cottages were sold shortly afterwards and remain private dwellings. 1947 Electricity was installed, using a 500 watt lamp with a range of 18 miles. The stand-by light continued to be powered by acetylene. The character of the light was now altered to a flashing sequence – 3 white flashes every 30 seconds. 1988 Trinity House, after a major review of navigational aids, announced their intention to discontinue five lighthouses, four light vessels, several fog signals and numerous buoys and minor lights. 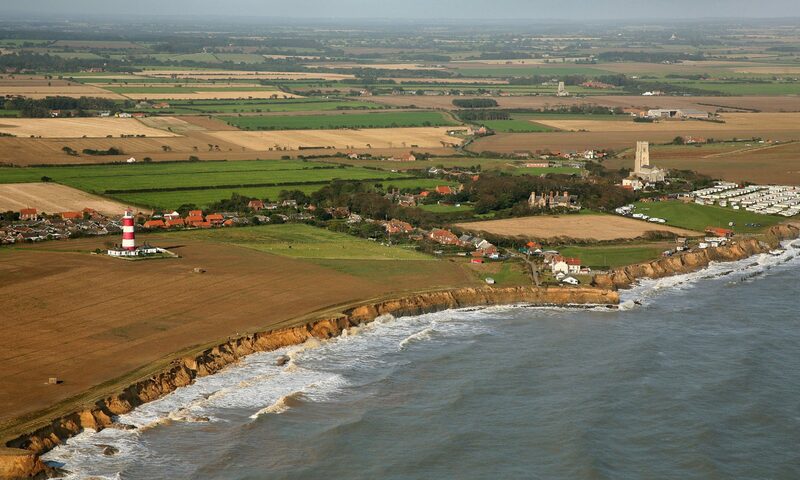 Happisburgh was on the list for closure. The date for scheduled closure and decommissioning by Trinity House was June 13th 1988.